This chapel, designed by George Bidlake of Wolverhampton and built by Mr Ashley of Newport, was built in the gothic style in 1876-7. Tenders for its erection were invited in May 1876, the chapel was built by Mr Ashby of Chetwynd End and opened on 24 May 1877. £122 was collected in donations on that day. A very detailed description of the chapel appeared in the Wellington Journal of 26 May 1877, page 5. It replaced a previous chapel which had been built in 1829-30 in Upper Bar, which by 1876 had become "old, decayed and not at all equal to the requirements of the town". The old chapel, of which the upper storey is still recognisable as a chapel, is now occupied by a tile shop. 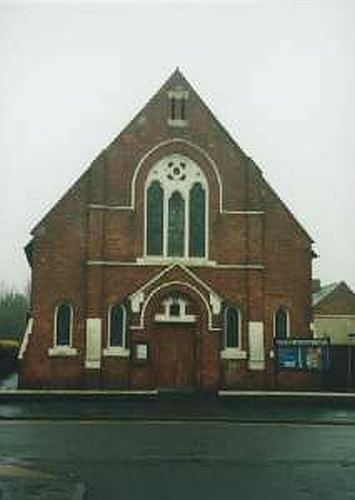 The present, 1877, chapel has now closed and was sold in 2001. By c. 2006 it was being used as a gymnasium. The Methodist congregation has joined with the United Reformed Church in Wellington Road and they meet in the Trinity Church.